Rudra was walking.Suddenly he bumped into Bhavya. Bhavya looked at him deeply. Rudra:Actually I find it difficult to pronounce your name.So I thought to call you Bhavu.How is it? Bhavya blushed:This is really sweet ji. Rudra:Cool.So you liked it.Thank God you have no problem with it. Bhavya:Why should I have problem with it?It’s such a sweet name. Jeene Laga Hoon Pehle Se Zyada. Bhavya waved hands at him:Bye ji. Rudra walked away.Bhavya’s eyes were on him. Pehle Se Zyada Tum Pe Marne Laga… (RAMAIYA VASTAVAIYA). Rudra:First I have to impress the eldest person of this family.Mataji.Mataji seems to be a devotional type.For that please teach me some devotional song Gopi aunty. 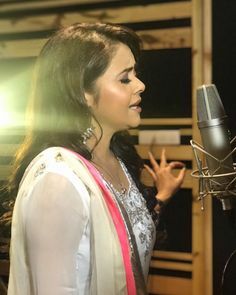 Avantika:That’s right.Who can sing devotional songs better than Gopi? Gopi smiled:Ok.I will teach you my Kanhaji’s song. Gopi started singing it.Rudra sang along with her. Nirmala lit the lamp.All were standing around her to pray.She started singing. Hey gopal krishna karon aarti teri. Rudra:I am sorry Mataji.I felt that you have throat problem and you should not strain.That’s why I sang.If you feel hurt please forgive me. Nirmala:No beta.I am not at all angry.I am only happy to hear a young boy singing Kanhaji’s song.It means devotion has not vanished from the younge generation.God bless you beta.You sang well. Tej to Harish:You have brought up your son very well.Though he is brought up outside India no one will believe it. Harish:Why you can’t believe it?I swear…Rudra is brought up outside India only. Tej:I know.I meant he has been brought up like an Indian with Indian culture and values. Jhanvi:Yes.It’s good to see NRI boys too following our Indian traditions and culture. Rudra:I am a complete Indian at heart. Romi whispered in Soumya’s ears:Jiju has impressed everyone. Soumya smiled.Rudra looked at Soumya.They both shared a sweet smile. Rudra stood near her and asked her in low voice:How was it? Soumya:Too good.But how did you manage to do it?I mean you like only rock music and peppy songs.Right? Rudra:Gopi aunty taught me.She is a bhajan expert. Soumya:Good that Gopi aunty taught you. Bharadwaj house is full of guests.Prem’s mother Sujata and Jhanvi were serving them juice.Suddenly Rudra took the juice tray from Jhanvi. Rudra:Don’t say anything aunty.This is the job of youngsters.You don’t take any strain.You rest. Rudra started serving everyone juice. Jhanvi smiled:Such a nice boy. Soumya noticed it with a smile. Soumya:Guess you impressed my mother.But It’s not easy to impress my father. Rudra:You wait and see how I will impress your dad.Tell me your dad’s interests. Rudra:Like…Mataji’s weakness is bhajans.What is your dad’s weakness? Rudra:Love birds?Very easy.I will buy some love birds and present them to him. Soumya:Stupid idea.Papa hates caging birds.He wants birds to be free.Every morning he feeds the birds which are seen outside. Rudra:Oh…So I need to get friendly with birds to get into your father’s good books.Not bad. Rudra:For the first time in this world someone may be making friends with birds to be his future fathe in law’s precious friendship. Tej went out to feed the birds.He was surprised to see Rudra throwing grains at the ground for the birds to eat. Rudra:It’s my habit to feed birds early morning.Poor creatures.They will be so hungry.I love feeding birds.I get happiness through it. Tej smiled:That’s so sweet of you.You are exactly like me. Rudra:Yes uncle.I also feel that we are very much similar to each other. He said in his mind:I am trying my best to imitate you to impress you Uncle. Shivay and Anika went out and did roaming. Anika:After a long time we are coming to India.I feel nice to have an outing in India. Shivay:Me too Anika.Our place is really beautiful. 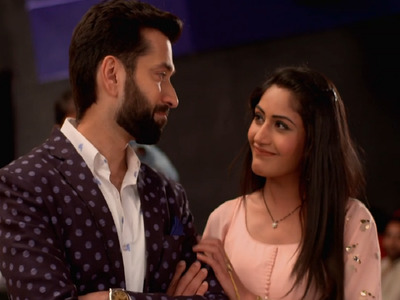 Anika:Shivay,shall we have food from the dhaba? Anika:Yes.Only when we come to India we will be able to eat from dhaba.Quite fed up of having fast food in London. Shivay:You are right Anika.I also would love to have food from dhaba. They both went to a dhaba and had food. Shivay:It has got a homely feeling into it. Rudra carried sacks of rice and grains to the kitchen.Jhanvi and Sujata were surprised. Jhanvi:Beta..why are you doing this? Rudra:Aunty…I told you.This is the job of youngsters.When we youngsters are there to carry all this why should others take trouble? Jhanvi:You are so nice.God bless you beta. Rudra:Bless you with what aunty? Jhanvi:Bless you with whatever you want. Rudra smiled thinking:God…bless me that I will get your daughter Soumya as my life partner. Rudra was having back pain as he carried heavy sacks. Soumya:What was the need to carry all of them? Rudra:I did it to please your mother for you Soumya.To get you I can do anything. They both looked at each other emotionally. Soumya:But see what happened to your health. Rudra:Nothing has happened to my health.It was just a small sprain.Since you are massaging with your magical hands it will disappear fast. Rudra:Continue massaging.It’s so romantic.I am enjoying it. Soumya blushed:Rudy…you are very naughty. She continued massaging his back and he was lost in her touch. Jhanvi to Tej:That boy is so nice. Jhanvi:Rudra Singh Oberoi.Prem’s friend’s brother.You know..he always helps me.He helped me in serving the guests…helped me in the kitchen. Tej:You are right Jhanvi.He is a nice boy.He too feeds birds like me.He has humanity. Jhanvi:Now a days where can we see such boys? Tej:You are right.It’s very rare to see a nice boy like Rudra. Soumya over heard this and smiled. Prem’s best friend Raghu came. Raghu:Yes aunty.I will help you in decoration. Sujata:That’s so nice that you are helping us. Raghu:It’s my best friend’s wedding.It’s my pleasure. Raghu decorated the house with flowers.Bhavya was surprised to see flowers on walls. Bhavya:Yes,I love flowers.It looks very beautiful. Raghu:I have brought something for you. Raghu:I had gone to temple.So I brought Prasad for you too. Raghu took Prasad from his bag and kept it on her palm. Bhavya:Thank you so much Raghuji.Why are you giving Prasad only to me? Raghu stammered:Because…because..I did’nt get that much to distribute it to everyone.It’s there only for you. Amazingly awesome.. Rudy is trying to be in good books of tej.. That feeding birds waali scene is my favorite.. The way srk says aao aao seems cute to me everytime.. And good to see raghav and bhavya.. They were paired in do dil bande right??.. Will be waiting for the next.. Till then take care..
Zee TV was the one and only channel we are having for Hindi in Malaysia last time… So, I used to watch some shows…. Honestly saying, I don’t like Bhavya but still I love Shivaani… I hope I will like RaVya in this story too….